Under the program, anyone can become a Diesel Ambassador and earn rewards. 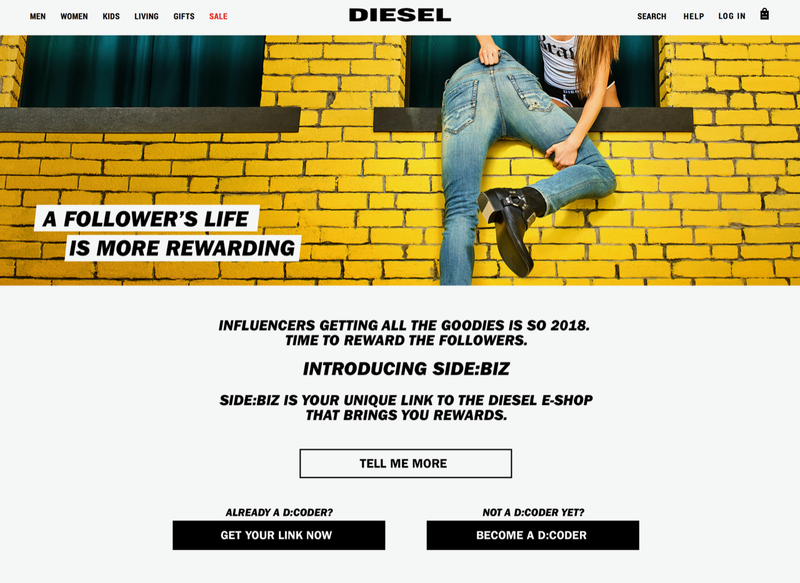 SIDE:BIZ is Diesel’s way of celebrating the followers, putting them first, and unleashing their full social media potential by equipping them with the tools needed to live successfully on their own terms. It’s simple: no pressure, no contracts, no proof of influence needed. To start a SIDE:BIZ, you just need to go to diesel.com/baf/sidebiz; sign up; receive a unique e-commerce link; and then share it, post it, text it and email it to everyone you know. Every time someone shops through your unique link, you earn rewards. Depending on where you live, these rewards vary from discounts and free products, to one-of-a-kind experiences. SIDE:BIZ will be available in Europe from February 15, in North America from February 18, in Japan from February 22, and it will be launching in China in March. With SIDE:BIZ, and the entire Spring/Summer ‘19 campaign, Diesel doesn’t just aim to show the world that life is easier as a follower. It also lauds the fact that followers are the social users that matter the most.